13th overall during the 2017 NHL Draft in Chicago on June 23, 2017. Suzuki and Yamamoto are not names that show up often on the back of National Hockey League (NHL) jerseys. But teenagers Nick Suzuki and Kailer Yamamoto — both picked in the first round of June’s 2017 NHL draft in Chicago — may be the start of a new trend. 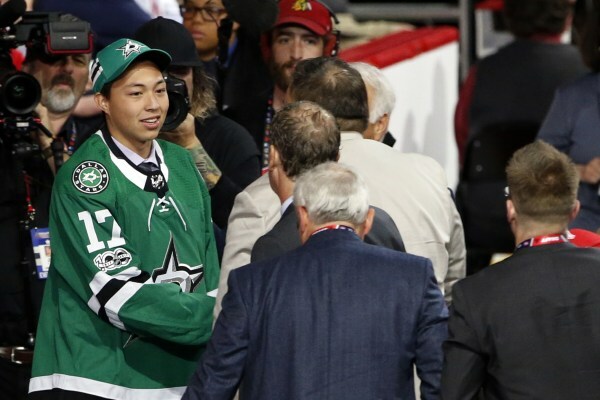 This year’s draft was historic, with Suzuki, Yamamoto, and Jason Robertson plucked in the first two rounds, the most Asian Americans to ever go that high in a single NHL draft according to William Douglas, a journalist from The Color of Hockey, which tracks diversity in the sport. Sooner than later, this might become the norm. As the Asian population has grown in United States and Canada, more and more Asian kids have taken up ice hockey, according to a team executive. During the 2015-2016 season, 983 players appeared in a regular season NHL game, according to statistics from NHL.com. Just four of them — Matt Dumba, Devin Setoguchi, Jujhar Khaira, and Joshua Ho-Sang — appear to be of Asian descent. “We’ve seen an increase in the number of players who have Asian heritage,” Mike Oke — general manager of the Peterborough Petes, which play in the Ontario Hockey League (OHL) — said. The OHL is one of the NHL’s primary feeder leagues. “It’s definitely kind of a big step for the community,” Suzuki, who was selected 13th overall by the Vegas Golden Knights and scored a goal in the new franchise’s first pre-season game in September, told NBC News. Suzuki grew up in London, Ontario, a city halfway between Toronto and Detroit. According to his father, Suzuki’s great-grandparents immigrated to Canada in 1909 and were incarcerated along with Suzuki’s grandfather in Kaslo, British Columbia, during World War II. 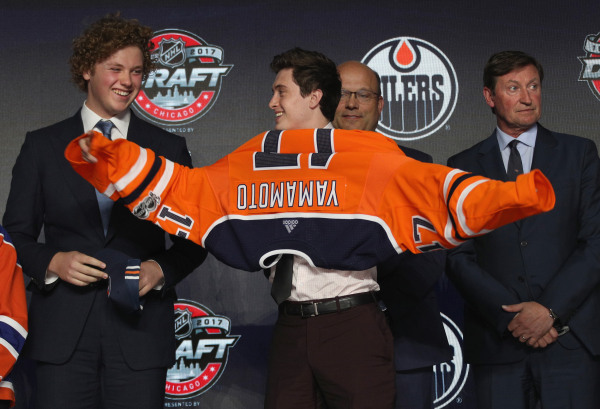 “I’m glad we’re getting our culture out,” Yamamoto, whose name was called by the Edmonton Oilers with the 22nd pick, said. According to Yamamoto’s father, three generations of Yamamotos were born and raised in Spokane, Washington, including Kailer and himself. Before the Yamamotos settled in the Pacific Northwest, Saichi Yamamoto immigrated from Okinawa to Hawaii, meeting his wife Momoyo. Both Saichi and Momoyo Yamamoto were incarcerated during World War II. during Round One of the 2017 NHL draft in Chicago on June 23, 2017. 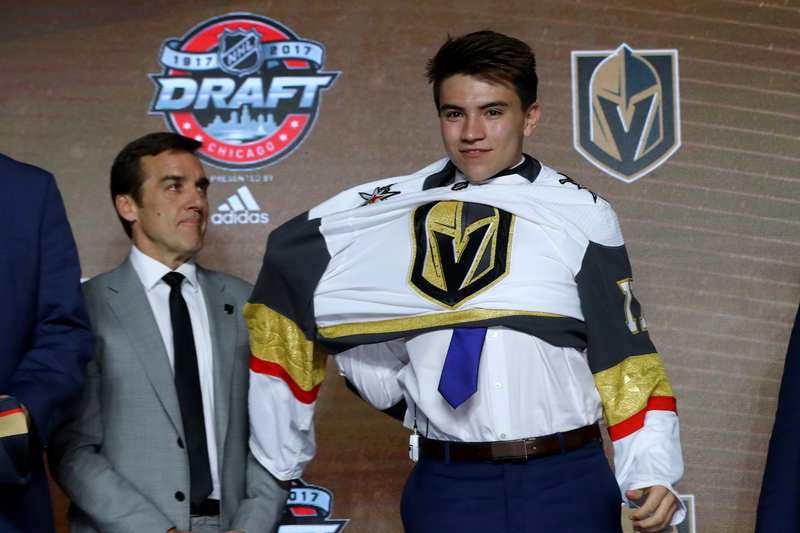 Unlike Nick Suzuki and Kailer Yamamoto, Jason Robertson, whose mother is of Filipino descent, did not grow up in a hockey hotbed. He was born and raised in the city of Arcadia in Southern California. “I love hockey, I want everybody to be part of it,” Robertson, who went 39th overall to the Dallas Stars, said. Combined, those states have an Asian-American population of more than six million people, according to data from the 2010 U.S. Census, nearly a third of the country’s Asian-American population. team during the second round of the 2017 NHL hockey draft, in Chicago on June 24, 2017. For each prospect, the prejudice that trailblazing Asian NHL’ers like Larry “King” Kwong and Jim Paek suffered was not something they dealt with. “Whoever you are, whatever you are, it all comes down to hard work and dedication,” Robertson said. But at least one aspect of their careers is similar to Kwong and Paek. Each is proud of being an example for Asian-American kids who don’t have a lot of role models in the sport. They’re already influencing their siblings: 16-year-old Ryan Suzuki and 15-year-old Nick Robertson were both selected in the first round of the most recent OHL Priority Selection, held on April 8. This junior-level draft is often a precursor to the NHL edition. So it’s possible there will be more Suzukis, Yamamotos, and Robertsons banging down the door of the NHL soon. “This isn’t a one-shot deal,” Douglas, the journalist, said.